First Line: The horse vans parked along Seventh Avenue came loaded up with dreams. Harry de Leyer needed a good horse, but by the time he fought through the horrendous winter weather, the only horses left at the auction were those on the truck headed to the slaughterhouse. Unwilling to admit defeat, he persuaded the truck driver to let him take a look at the doomed horses loaded in the back. A certain look in the eyes of a neglected plow horse spoke to Harry, and after paying the driver $80 for the horse, Harry took him home. At that point, the horse-- dubbed "Snowman" by Harry's children-- was probably the only one that knew he was poised at the beginning of his very own Cinderella story. This is the story of a plow horse turned schooling horse turned show jumping champion. It is the story of the man who saved his life, Harry de Leyer. Most of all, it is the story of the deep love the two have for each other. The book grabbed me at the very beginning with the tale of how Harry found Snowman and brought him home. I was chomping at the bit for more, but Letts switched leads and began telling Harry de Leyer's story of life before and during Nazi occupation in the Netherlands, and the immigration of Harry, his wife, and children to the United States. Don't get me wrong: Harry's life is extremely interesting, but after that excellent beginning, his story almost ground the pacing of the book to a complete halt. I was tempted to skip ahead and get back to the horse, but I wouldn't let myself. Once the chronicle of Harry's story caught up with Snowman's, the book took wings again. Letts' research and interviews give The Eighty-Dollar Champion the richness of detail that it needs. The show jumping circuit in the late 1950s comes to life, and I felt as if I got to know what it was like to work Snowman at his "9 to 5" job and then load him in the trailer to compete in shows. After the stumble at the start, the book only took one more misstep as it headed for the finish line. As Snowman started to capture media attention, the author seemed to make a bid for comparison to Laura Hillenbrand's classic Seabiscuit by adding brief sections about the uncertainty of the era, how it needed a hero to believe in, and how the working class public focused on Snowman-- a very unlikely champion. 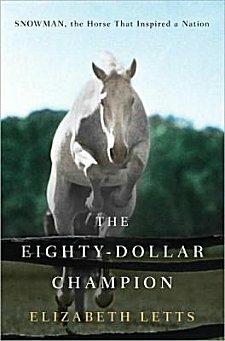 These sections don't really fit into the book because the focus of The Eighty-Dollar Champion is a very narrow one: the relationship between a very special horse and a very special man. Attempting to bring the outside world into this just doesn't work. Although I did find a bit of awkwardness in the book, I absolutely loved the story of Snowman. However, as a word to the wise for anyone who falls apart at the end of Old Yeller or who has had a beloved pet die-- keep a box of tissues on standby. You will need them. I love underdog stories and Snowman sounds like he was quite the underdog. Hmm. I was curious when I saw the cover in your sidebar if it was going to be worth getting. I'll have to put it on my list. Kathy-- He was a plow horse facing blue-blooded Thoroughbreds with millionaire owners. Love and trust gave him wings. Pepper-- If you love horses, I think you'll really enjoy it. Just remember the tissue-on-standby warning!